The Schlage Sense Smart Deadbolt offers the perfect stylish convenience for your home. Its illuminated touchscreen gives you easy accessibility, eliminating the hassle of fumbling around for your keys. For better versatility, when you pair your lock with the Schlage Sense app you gain even more key-free opportunities. Additionally, the Schlage Sense Smart Deadbolt is compatible with Apple Home Kit technology - which allows you to use Siri on your iPhone, iPad or iPod touch to unlock your door. That connectivity puts you in greater control of your home, which means the Schlage Sense lock doesn't just make your home smarter - it makes your life easier. Featured in a beautiful Century trim, this deadbolt perfectly complements the Century collection interior hardware. The striking appearance of the classic, matte black finish creates an elegant look that's sure to complement any style setting. Plus, it's been designed to meet the highest industry standards for strength and durability. Tbook.com crawls the web to find the best prices and availability on Locks and related Tools and Hardware products like Schlage Century Matte Black Sense Smart Lock. For this page, related items include products we find that match the following keywords: "Lock" at our vendor partner Home Depot. 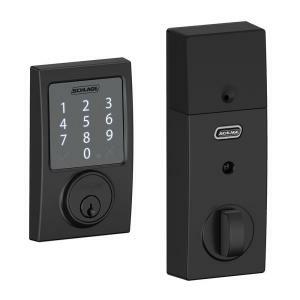 Schlage Century Matte Black Sense Smart Lock is one of 147 Locks and related products listed in the Tools and Hardware section of Tbook.com If you have any questions on this product, please give us a call at 734-971-1210 during the hours of 9am - 5pm EST for assistance. Thank you for shopping at Tbook.com, the Internet Department Store!